Where is the pickup location for this rental? Do you provide a pickup service? Yes, complementary pick-up is provided from any where in Key West. Your confirmation email will contain a local phone number to coordinate your pickup. A: All passengers must be able to reach the foot holders with their feet - usually passengers have to be at least 4 feet tall. Q. Is there an age requirement to drive a scooter? You must be at least 18 years of age in order to drive a scooter. 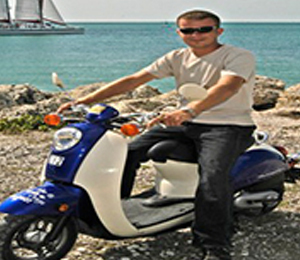 I have been to the Bahamas many times, but 1 Seater Scooter is one of my favorite trips! It includes everything that everyone should do here. As a Bahamas veteran, I can say only the best about this experience!